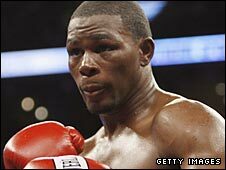 Jermain Taylor has warned WBC super-middleweight champion Carl Froch to underestimate him at his peril. Former undisputed middleweight champion Taylor takes on undefeated Froch in Connecticut on 25 April. Taylor is vowing to relieve Froch of his title, in what is the Nottingham fighter's first title defence. "The worst thing Carl could do is to underestimate my power just because I'm moving up in weight, that would be a mistake," Taylor told BBC Sport. "I'm not worried about his strength. He's a strong fighter, so what? I'll just go in there and box the hell out of him." Taylor defeated Jeff Lacy in a November eliminator to win the right to become Froch's first mandatory challenger for the title he won in December. The 30-year-old Taylor first became a world champion in 2005 when he beat fellow American Bernard Hopkins on points, before beating him again in a rematch. How good is Carl Froch? Taylor held the undisputed middleweight crown until 2007 when he was beaten by Kelly Pavlik. But Taylor was unimpressed by Froch's victory over Canadian Jean Pascal in December and is determined to win a world title again. "It has been easy getting prepared for this fight because it's a title fight," said Taylor. "I have been in this situation before when I was getting ready for Bernard Hopkins. "I will be prepared for anything that Carl brings in that ring and ready to make adjustments if needed. "Was I impressed by his victory over Pascal? No." Froch, 31, holds a record of 24 wins, with 19 knockouts and no defeats while Taylor has lost twice in a 31-fight career - both times to Pavlik. But Taylor says he is in the best shape of his life for the clash with Froch. "Every time I get up in the morning, I say to myself, 'let's go get that belt back'," Taylor said. "This camp is a lot more focus and intense because there is a championship title on the line. "It's a totally different camp. I can see it in everyone's faces. They want the title back as much as I do." And Taylor believes his hunger to regain the crown will see him emerge victorious in April. "I'll be honest, I didn't know what I had until I lost it", Taylor said. "Now I want it back. I'll do the hard work that it takes to get it back. I know now what it takes. I know if you get comfortable, you'll lose. "There's nothing comfortable about this camp. I'm very focused on what I have to do for victory. I'm bringing a lot of firepower and explosives with me when I enter the ring on 25 April." "I'm the one wanting the title, not him. He's trying to keep the title and make a name for himself by fighting me. He has never fought on this level or anyone like me before. "I'm going to take him in deep water and I hope he can swim."